Thursday, the Samahang Basketbol ng Pilipinas (SBP) stated that the search for a new coach and a new Gilas Pilipinas team is currently on the way. It was also announced that a formation committee will undergo selection so that they will be able to oversee the assembly of the next national basketball team. 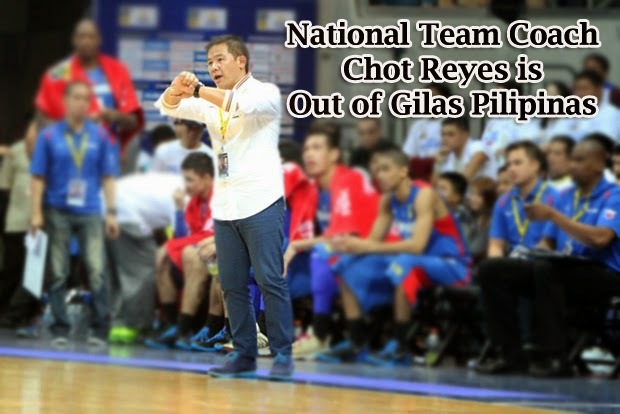 Upon announcement, the disbandment of the national team took its effect and removed Chot Reyes as the national team coach roughly a year after the team had finished second in the 2013 FIBA Asia Championship. The president of SBP, Manny V. Pangilinan said in a statement that a proposal for a “participative and consultative approach” was made concerning the initial process of selection for future members of the national teams to address at least nine international tournaments that are scheduled in 2015. It is stated that various elite tournaments such as the FIBA Asia Qualifying, World Cup, Asian Games, which involve PBA players will have to go through a community that is composed of Board members from the SBP from PBA, PBA D-League and the SBP itself. On the other hand, representatives of the UAAP, NCAA, CESAFI, NAASCU and the SBP composed of SBP board members will make up a screening-selection committee through executive director Sonny Barrios. Barrios will be the one who’ll oversee the team selection not involving PBA players. One of the key tournaments SBP is preparing for is the 28th Southeast Asian Games in June 2015. They are also giving attention to the 28th FIBA Asia Championship to be held in China sometime in August 2015. This FIBA Asia competition will serve as the regional qualifier and will lead to the doors of the Rio de Janeiro Olympics in 2016. According to SBP, the committees will short-list the candidates for players and coach for submission to the Executive Committee of SBP made up of SBP chairman, president, vice chairman, vice president and executive director in order to gain the favour of receiving the “ultimate final approval” of the SBP Board of Trustees. Gilas program stays, says Chito Salud, PBA Commissioner. However, the PBA chief has later clarified that the SBP will not be dissolving the Gilas program. Instead, it will be reinforced through the synchronization of the league’s calendar with the national team’s training schedule. Salud added that they also aim to fine-tune the program through a stronger collaboration and effort between the SBP, PBA and any other stakeholder.